In a large bowl, combine 2 cups flour and 1 teaspoon salt. Cut in lard until mixture resembles coarse crumbs. Stir in water until mixture forms a ball. Divide dough in half and shape into balls. Wrap in plastic and refrigerate for 4 hours or overnight. Roll one ball out to fit a 9 inch pie plate. 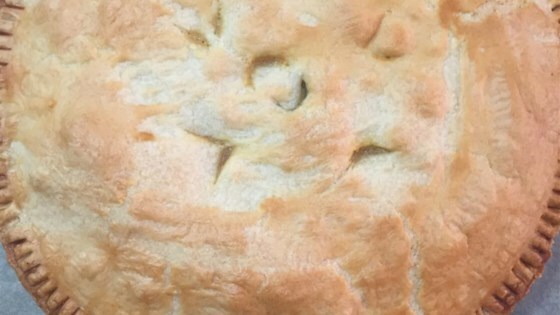 Place bottom crust in pie plate. Roll out top crust and set aside. In a large saucepan, melt 1/2 cup butter. Blend in flour, salt, pepper and onion. Gradually stir in chicken broth. Cook, stirring constantly until smooth and thickened. In a separate pan, saute mushrooms in 3 tablespoons of butter, then stir into saucepan. Stir in chicken, carrot, celery and potatoes. Mix well and pour into bottom pie crust. Cover with top crust, seal edges, and cut away excess dough. Make several small slits in the top to allow steam to escape. Bake in the preheated oven for 30 minutes, or until pastry is golden brown, and filling is bubbly. I followed this to a "T". cut potatoes into 1/4" - 3/8" cubes. They definitely were not done. I recommend par-boiling them.